So now we’re all scared of gypsies, apparently. When we started this storyline, everybody treated the gypsies like a joke, just some Central European drifters who dreamed of going on the road and selling fake elixir to the gadjos. But Magda hexed up Quentin with a werewolf curse, and all of a sudden they’re the Furies, unstoppable grudge-holders who could ruin your life with the snap of a couple of fingers. Then the show introduced Count Petofi, the badass crime boss who can resurrect the dead just to get out of an awkward conversation. Petofi can clearly handle himself around gypsies — he’s already killed one, and enchanted another. But it turns out that there’s something scarier than a gypsy, namely: Two gypsies! And here they are, the ultimate trump card: Johnny Romana — King of the Gypsies! — and his well-muscled traveling companion, Istvan. They’re armed with head scarves, scimitars and yelling, and that appears to be enough to scare everybody else silly. Now Magda’s on the run, desperate to escape from her colorful captors, and Petofi is hiding in the basement, hoping they’ll blow over. So here’s a question: why don’t they just get some guns? Magda lives next door to Collinwood, where you can find ranged weapons hanging on every wall. There’s a candy bowl full of silver bullets in the foyer. Yes, Johnny and Istvan are physically intimidating guys, but they left Magda a note, telling her they were coming to kill her. She had plenty of time to hop over to Collinwood and stock up on crossbow bolts. This is a solved problem. What we’ve got, for the next two days, is a cryptic runaround that sends everybody in circles while the writers try to figure out where this gypsy story is going. This happens all the time on soap operas — there’s so much time to fill, and sometimes you just end up moving characters from one set to another, in lieu of anything happening. You can tell that this pair of episodes is mostly just stalling, because the characters spend the whole time staring at clocks, counting down to something that doesn’t really happen anyway. So I might as well enter into the spirit of things, just follow everyone around and try to look interested. 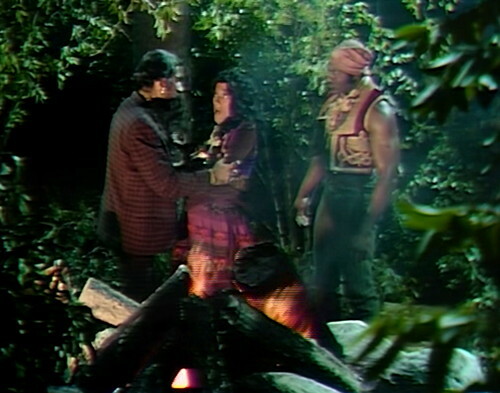 At the moment, Magda has given the gypsies the slip, and she’s run back to Collinwood, which is one of the two places where they’re most likely to look for her. But at least she’s got friends here, and furniture, and there’s probably a rocket launcher in a closet somewhere. Oh, and there’s brandy, obviously, which is Quentin’s answer to every question. It’s a little weird to stop for a drink in the middle of your action-adventure chase sequence, but Quentin’s the brandy expert. I try not to backseat drive his adult beverage decisions. Magda explains that the gypsies are after her because they’re looking for the Legendary Hand of Count Petofi, a powerful artifact that is currently attached to the rest of Count Petofi. Quentin asks why she didn’t tell the gypsies that Petofi has the Hand — and when she doesn’t answer, he says, “Magda, you’ve had a spell put on you, haven’t you? Something that prevents you from talking about him.” This is the advantage of being on Dark Shadows long enough; you’re able to diagnose a situation like this. So Quentin gets a Big Idea, which ties together a couple different story threads that have been hanging around loose lately. It starts by talking to Beth, so he leaves the drawing room, shutting the doors behind him. You can always tell when they’re really desperate to fill time on the show, because everybody spends the day opening and closing doors. That’s why Magda came over to Collinwood in the first place; there aren’t any doors to close when you’re running around in the woods. There’s actually a moment at the beginning of the drawing room scene when Quentin says, “I’m just going to shut the window,” and then he walks across the room, shuts the window, walks back, and continues the scene. The round trip only takes eight seconds, but in a situation like this, I guess every second counts. After Quentin exits into the servant’s quarters, we watch Charity walk across the landing, all the way down the stairs, and through the same door Quentin took. 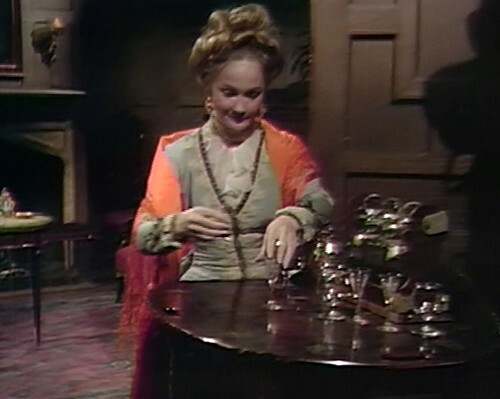 Then we pan back to the drawing room doors for a second, and after that it’s time to watch Magda pace around the room and emote at her brandy glass for half a minute. I’m telling you all of this because I have literally nothing else to talk about right now. Oh, except for Charity Trask — now and forevermore possessed by the spirit of a Cockney showgirl who came over to the house once — who’s decided, as of today, that she is desperately in love with Quentin. When we saw her last week, she was mildly flirtatious with him, but she was mostly interested in hanging out in the drawing room doing an unscripted dance number. It seems to have occurred to somebody that if you’re going to have Nancy Barrett play a demented floozy, then you should probably give her something to do, besides hang around the house scandalizing her father. More on this in a moment. Next, Quentin sets up his time-killing plan. He scribbles a note, and passes it to Beth, asking, “You’re sure you know what to do, if I’m not back here by one o’clock?” She says she does, and he tells her not to be worried. Beth says yes, although that’s at least three different contradictory sets of instructions. Beth immediately leaves the room, taking her eye off the clock and already violating protocol. We keep an eye on it instead, pulling in tight so we note that it’s around 11:30. If Quentin’s plan doesn’t spring into action until 1:00, that means we’ve got three episodes before anything actually happens. Fortunately, they can use narrative time compression so that we don’t actually have to wait an hour and a half. They manage to trim it down to about fifty minutes. So it’s back to the drawing room to check in with Magda, who’s still nursing that cup of brandy. She hears some noise which is clearly coming from the foyer, so she does what anyone would do — she walks over and opens the window, to look outside. They really love opening and closing things on this show; they’re basically kittens. Beth comes in, so she can walk across the room and then lead Magda back across the room, yapping all the way. She tells Magda that Quentin’s gone to see Count Petofi, and Magda stops dead in her tracks for another burst of dialogue. “He went there?” she wails. “Oh, why did he go there, that crazy man, why didn’t he do what I wanted him to do, and let the gypsies take care of what they want to take care of? Aahh!” And she walks out of the room. And I swear, I never noticed before how much Magda sounds like Chico Marx. Has that occurred to anyone? 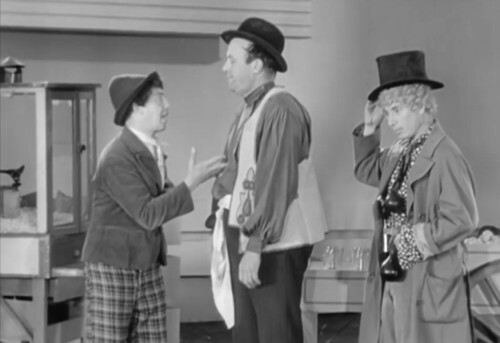 I mean, check out the lemonade scene from Duck Soup. It’s the same line; Magda and Chico are twins. This could be integral. Then we go over to Count Petofi’s secret hideout for the next scene. Current time is 11:45, stay tuned for traffic and weather on the 7s. Quentin comes over, as advertised, and starts stroking Petofi’s clock. He says that he’s here for Barnabas Collins, the former main character of the show that Petofi’s been keeping in cold storage for the last couple weeks. Petofi sneers, and Quentin informs him that he has until 12:45 to think about it. If he’s not back at Collinwood by precisely 1:00, a note will be delivered to the gypsies, telling them where Petofi is. Now, Petofi has the Hand, and he could use it to make Quentin tell him who has the note — but Quentin says that Angelique’s got it, and her witch powers could cancel out the Count’s. Petofi acknowledges that puts them at a stalemate, but he tells Quentin to get out anyway. 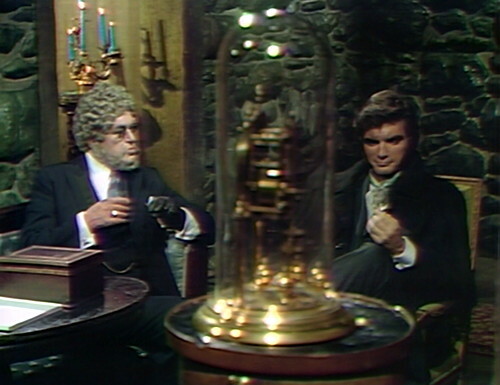 Quentin says he refuses to leave without Barnabas, so Petofi offers him a seat and a brandy, prepared to sit around and do nothing all night, if he has to. So, as Quentin and the Count settle into the world’s weirdest one-hour cocktail party, I have a few questions about this foolproof plan. First: Why wait an hour? 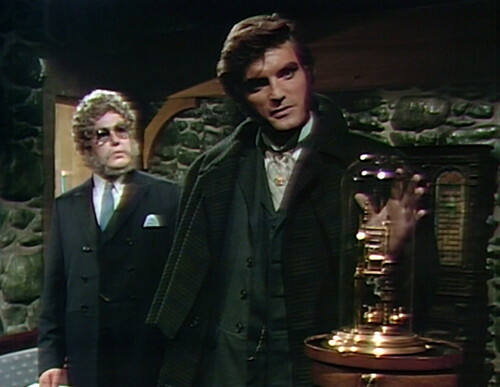 We know now that it’s fifteen minutes to walk from Collinwood to the mill, and fifteen minutes back, so Quentin is offering Petofi an hour of leisure time to decide whether to release Barnabas or not. How come? Second question: Why doesn’t Quentin just tell the gypsies where Petofi is? They could storm in, take care of the Hand, and then Quentin could free Barnabas in the aftermath. Third: Why didn’t he give the note to Angelique? It’s a good idea — it completely stymies Petofi — and you’d think she would be thrilled to take some action to free Barnabas from his prison. Plus, it’s not like she has anything else going on right now. So why did he give it to Beth? And, finally: How is Beth supposed to know where the gypsies are? Quentin didn’t ask Magda where they were, and she doesn’t even know anyway. All Quentin knows is that they’re outside somewhere. I mean, I know there aren’t that many sets, but still. This is not a well-thought-out plan, and we now have a whole hour to think it out. Happily, there’s something else going on that we could look at, namely: Pansy Faye suddenly becoming a psychopath. 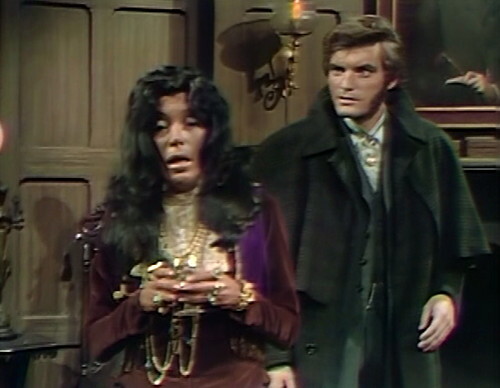 On Dark Shadows, the line between harmless eccentric and deadly assassin can be fuzzy, and there’s a lot of casual murder attempts, so it’s easy to just accept this as the next logical step in Charity’s storyline. But it’s worth noting that up until five minutes ago, Pansy was a happy-go-lucky goodtime girl, content with someone to talk to, a little floor space for dancing, and easy access to the rouge supply. Yeah, she’s a bit dotty, and it’s not clear whether she actually understands why people are calling her Charity, but she’s clearly in it for the lulz. Except now she’s decided that she’s in so deeply in love with Quentin that she has to kill his current girlfriend and wear her skin. 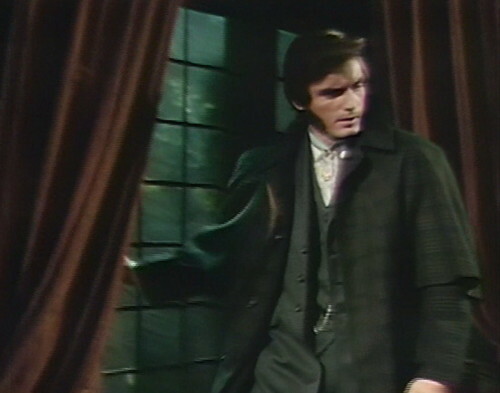 It’s kind of an upsetting turn for a purely comic-relief character, but it’s Dark Shadows, and if you’re not trying to murder anybody then it’s hardly worth pointing a camera in your direction. The only thing here that needs no explanation is where Pansy got the little airplane-sized bottle of poison. This is Collinwood; she probably opened the junk drawer in the kitchen. So that’s what we’re doing for the next episode and a half, really. Locking doors, unlocking doors, offering each other brandy, keeping an eye on the clock, taking an eye off the clock, and talking incessantly about the gypsies, who never arrive. There’s a whole act cutting back and forth between these two late-night social engagements, and by the end of the episode, we’re still only up to 11:40. Tune in tomorrow for more doors, clocks, brandy, threats and maybe another couple looks at Istvan’s crotch area. The end. There’s an odd time jump over the last couple episodes. Tuesday’s episode ended at night, with Magda running away from her gypsy captors. Then Wednesday’s episode focused on the Tim/Amanda/Tate story, and mostly took place in the daytime, with the final scene in the early evening. 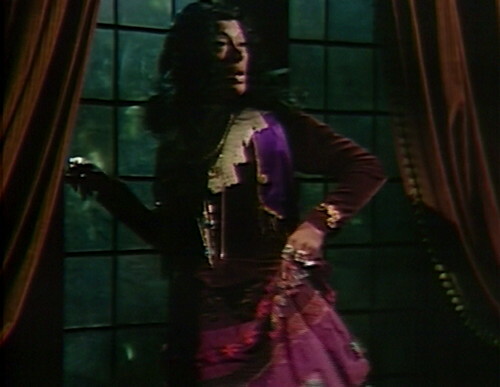 Today begins at night, with Magda reaching the front doors of Collinwood. Was she running for a full day? As the scene opens with Petofi smoking with one hand and drinking with the other, he’s clearly looking at the director for his cue to start the scene. In the next scene with Petofi, he’s pouring himself another drink, and a person’s shadow crosses the candelabra next to him. When Charity unlocks the drawing room door, the sound effect doesn’t match the action at all. Beth is about to finish her brandy with Charity when the clock chimes. She reacts to the sound, and then we cut back to the mill, where the camera pans halfway up the clock, which appears to read 12:40. 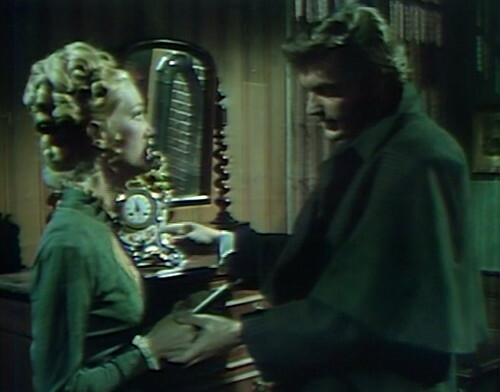 Before the clock face can be seen in full, they cut to another camera, with a close-up of Petofi. Quentin says that Petofi has five minutes left, so it is supposed to be 12:40. So why was the Collinwood clock chiming for 12:40? This episode has a double number, to make up for last week’s unscheduled pre-emption. I’ve watched 1897 DS for many years and never noticed the Crotch of Istvan. I was focused on the Hand of Petofi. Thank you, Danny. I’ll never be the same. As for Nancy Barrett playing a ‘demented floozy”, well, she was married to David Ford. Perhaps some real life channeling was present. She was also great as Faith Coleridge on Ryan’s Hope. Another favorite. As much as these plots do have holes in them the stellar cast always carries them through. I don’t think anyone would have watched the original DS without these great actors. I think the idea right now is that Charity is “crazy,” and “crazy” justifies any sudden mood swings into homicidal drink preparation. They’ll eventually settle on her actually being Pansy Faye and thus just as “sane” (more or less) as Faye was when alive. Magda is in fact the fifth Marx Brother (not including the actual fifth Marx Brother). Chico is the only one of the obvious three who – as famous as they are – could still be called underrated. So it’s nice to see him used here. If a tambourine scares him so, you should try an accordion. In the 1841 PT storyline, Bramwell dresses like Chico Marx. Perhaps mute Istvan is meant to remind us of Harpo. Nice reference to Tom Waits’ Step Right Up.